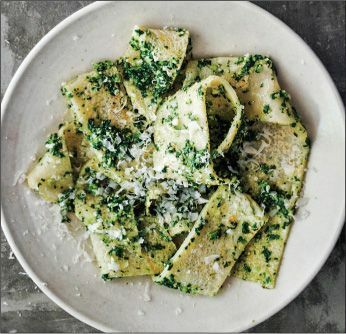 You don’t need a lot of time or any special tools to make fresh pasta, says Jenn Louis in The Book of Greens (Ten Speed Press). A testarolo is “basically a crepe”—an ancient form of Italian pasta made by cooking a thin batter in a pan. Once cooked, it can be spread with the pesto of your choice, or cut into diamonds or strips, briefly immersed in hot water, then tossed with a pesto. Pesto, of course, is a highly adaptable sauce, and “I love what broccoli rabe does to pesto,” lending “just the right amount of bitterness, earthiness, and fibrous texture.” If you wind up with extra, use it as a sandwich spread or to liven up polenta, or spoon it over roasted meats. If you’re tossing it with pasta, rather than using it as a spread, thin it to the right consistency by adding extra olive oil, tablespoon by tablespoon. In a bowl, combine semolina, flour, and salt. Whisk in water until you have a smooth batter; cover bowl with plastic wrap. Set aside 1 hour. In a 7-inch nonstick skillet, heat 1 tbsp olive oil over high heat. When oil and pan are hot, add 4 to 6 tbsp (about a ladleful) of batter, remove pan from heat, and spread batter thinly with side of spoon. If batter does not spread easily and sticks to pan, try again without using oil in pan. Return pan to heat; cook until batter is set and there are a few spots of golden color, 2 to 3 minutes. Flip, cook briefly, about 1 minute, on second side, and remove from pan. As testaroli are ready, stack on a plate and cover with a kitchen towel. Repeat until all batter has been used. Fill a large bowl with ice water and bring large pot of salted water to simmer. Submerge broccoli rabe in simmering water and blanch until tender, about 3 minutes. Drain and immediately plunge in ice water to cool. Once rabe is chilled, remove from water and with a clean, dry towel blot excess moisture. Chop rabe into 1-inch pieces; combine in blender with pine nuts, garlic, cheese, olive oil, and lemon zest. Process until mostly homogenous, working quickly so greens do not become warm. When smooth, season with salt. Use immediately, or with a plastic spatula scrape into a small airtight container and refrigerate for up to 3 days. Cut crepes into diamonds or strips. Briefly immerse in boiling water. Drain, then toss with pesto. Serves 8 as an appetizer.